Yes, I made another t-shirt! 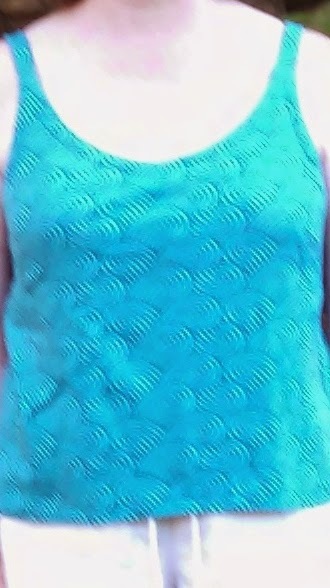 I used the same pattern (of course), and changed the neckline. I rotated the dart to the center front and gathered the fabric. Short sleeves for the season--perfect! Or so I thought...sigh. I found this fabric at another shop about an hour or so away. This shop used to have more dressmaking fabrics and has gone quilty. I managed to find this knit--the selvage says it's by Moda--must be ancient! It is very soft and thick. I actually had enough left over to eek out a tank top, too. I had to shorten the bottom in order to squeeze on the pattern, but I don't think it's too short. This will be nice for the beach, and hot summer days working outside. I need to take out the back straps and resew because they don't quite line up with my bra straps. Not sure it's worth doing though. Apologies for the very blurry photos! My photographer wasn't feeling cooperative at all--I guess I wasn't feeling overly cooperative either because of these T's. I used nearly every last bit of fabric! yay! Now for the worst part: This fabric has worn horribly. I loved both tops after making them. After wearing the short sleeved t-shirt twice, the third time (which was not a charm) I noticed that the shoulders weren't right. When I made the shirt, they sat perfectly on me. Now they were overhanging just a bit. Being optimistic, I thought washing might help. But no. It's only gotten worse. This was one of the rare times when I decided to not put elastic in the shoulders--big no no. When I took Sarah Veblen's knit class in the fall she had suggested letting knits be knits, and that we don't always need to do extra things to them to make them behave. However, in this case I don't think elastic would've mattered. The tank top is growing sideways...and I've noticed the T is doing the same thing. Really, my midsection is not that big!!! Oh well. Work or lounge wear? Anyway, I got wild with my order from them. While I cannot say great things about delivery--what is with mail order delivery these days??? Slower than molasses in January--I can say that my order was delightfully packaged. The fabrics were even identified with their manufacturer's location. Two of my fabrics came from Canada, one from the U.S., and one from China. I don't recollect seeing that on labels at the Joann's stores, but I really liked it, and thought it was interesting. The fabrics in my kit were not labelled, but I would assume that they were from Canada as that's where the other knits from a similar category came from. At this point, I haven't gotten into this order or my EmmaOneSock purchase. 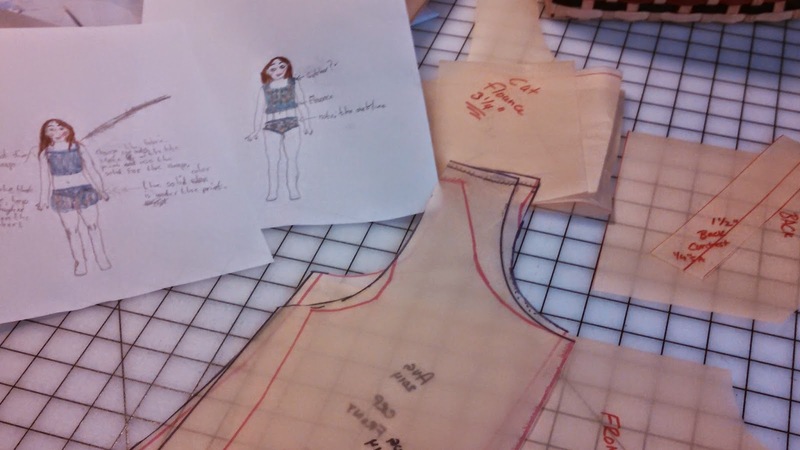 Instead, I've worked madly on some dresses and swimsuits. And now I've committed to making a 6-PAC. I'm in the process of redrawing my t-shirt pattern yet again. Let's see if I can't get caught up blogging! Early this year I was thrilled to receive a gift certificate to Emma One Sock!!! Yay! Then much hand wringing ensued. What to choose??? Things that had looked great earlier in the year weren't there any more. Things that kept appearing as new listings weren't appealing to me. Finally, everything clicked after many browsing sessions--which, after all, were half the fun! Perfect for a gift! Our sewing guild is having a denim challenge this year. Jeans or a dress??? As always, I am verrrry slow about getting things sewn up. But knits are so easy that I think this won't wait too long! And this year I am determined to work on making at least 2 pairs of jeans for the fall/winter. As I mentioned in a previous post, I had another version of these patterns I wanted to make for dd. This outfit will be the last from these patterns at least for this year. How many matching capri outfits does a girl need for one summer? I used fabrics purchased from Sew It Up. They have really cute kits on their website, so I ordered this from them, minus the pattern because I had similar ones already. At this point I cannot remember what patterns they suggested? The top is a straightforward sew, but I still dislike the floppy waist. On this version I ran 3 columns of stitching down it to hold the gathers in place. The seersucker, if it was a plain cotton or a poly/cotton blend, would've behaved nicely. As it was the seersucker was a cotton/lycra blend so it had a little "sproing" about it. The gathers aren't as nice as I might have wished, but they aren't terrible either (unless I point them out to you!). The bubble fabric in contrast to the seersucker is an ultra crispy densely woven 100% cotton--rather nice. Both fabrics are something I never would've found around here. It was a case where it was really nice to have bought a kit. I had plenty of fabric to work with or around since I did line the upper bodice with some plain white batiste. The kit should've been made up a few years ago...in which case the slight fabric improvisation would not have been necessary. On the other hand, the bubbles might've shown through so I probably would've done the same thing. 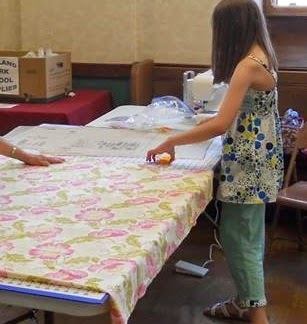 Here are some pictures of the outfit in action during our sewing guild's first ever sewing camp! Terrible posture...but the back does hang very nicely. To accurately place the second row of elastic, I cheated and ironed on some lightweight fusible interfacing from SewKeysE. 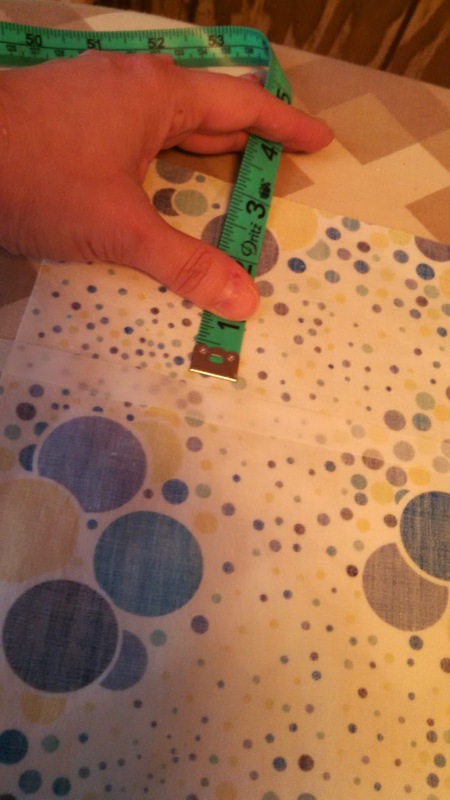 It was a quick and easy way to align the bias tape on the back to hold the elastic. Edited to add a photo with her standing up straight for a back view! After I made the lavender set, I noticed that dd's could use some adjustments. My other dd never needed any adjustments, and I suppose since it's been awhile since I've sewed for this dd I just didn't think about it. For the pants, I had to scoop out the back then add the same to the crotch seam. I also added some height to the top of the back pants--she has a huge problem with pants/jeans sliding down when she bends or sits. Rather frustrating for us both. This adjustment (which I should've photographed) seems to have worked really well for her. The rest of this summer has largely been spent sewing for me! Yay! More later. On a recent trip to Richmond, I had the opportunity to visit a couple of fabric stores. Unfortunately, one of them seemed to keep casual hours so I didn't get to shop. Oh well. However, I thoroughly enjoyed my excursion to Chadwick's Heirlooms! They are on the west side of Richmond in a large building that's sharing space with an antique store. 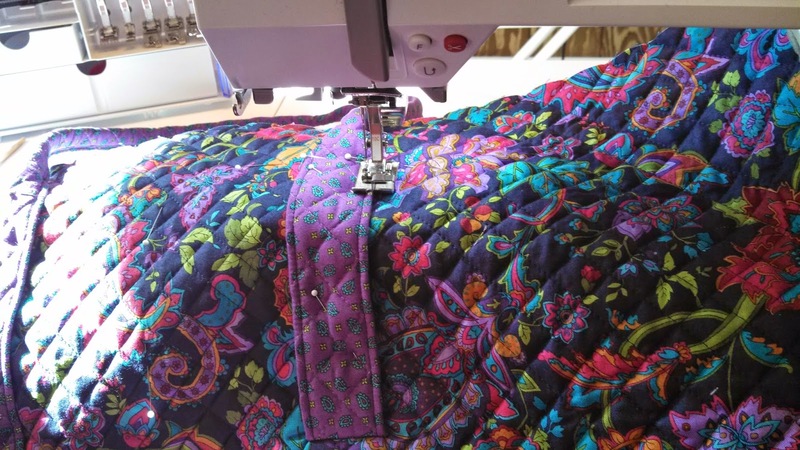 They carry a huge supply of fabrics, patterns, laces, and everything heirloom sewing--plus a great selection of quilting cotton. However, they also had some other things like twills and beautiful floral cotton lawns like Liberty prints and others. Those florals were a huge temptation, but since I didn't have anything in particular in mind for them I didn't buy any. I did buy a navy twill (shorts/pants), a bunch of Imperial batiste in white (just to have on hand), 2 patterns (Trisha by Maja's Heirlooms and the Pinwheel Tunic & Slip Dress by Oliver + S), and a pincushion. Not much to say about anything but the pincushion. It's not like I needed another one, but this one is a wrist one and it fits! Its armband is leather and very soft. My wrists are pretty small so finding something comfortable and that fits can be challenging. It's my first one ever for my wrist, and I think I will really like it! I think Chadwick's has such an extensive selection of fabrics, that even if you are not an heirloom sewer you will find something to love! In my last post I mentioned alternating something easy with something hard. 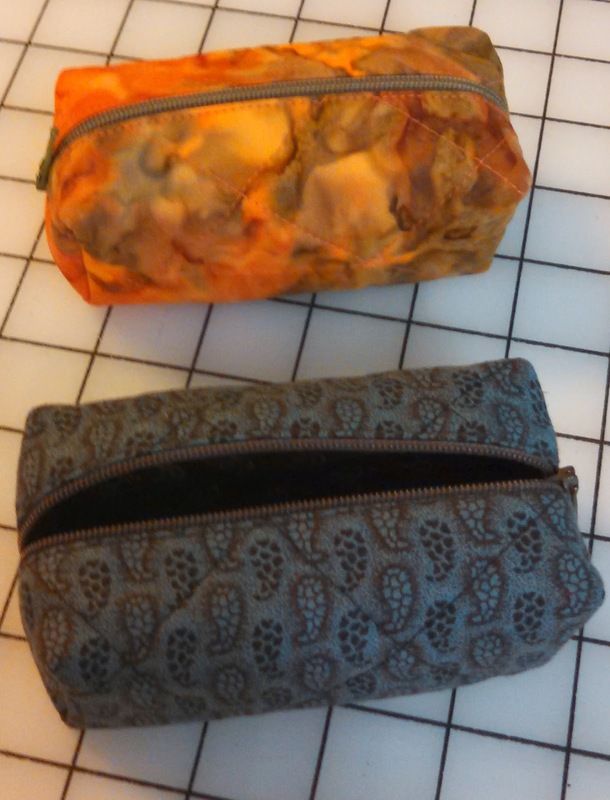 After making the lavender outfit for dd, I decided to make some small zippered bags that the ASG youth will be sewing later this year. It helps me as the organizer to see how difficult/easy a project will be. The store, Creative Quilting Connection, where the youth meet have kits made up with all the supplies needed including instructions and 1 zipper (you have to buy 2 more because the kits will make 3 of the bags). 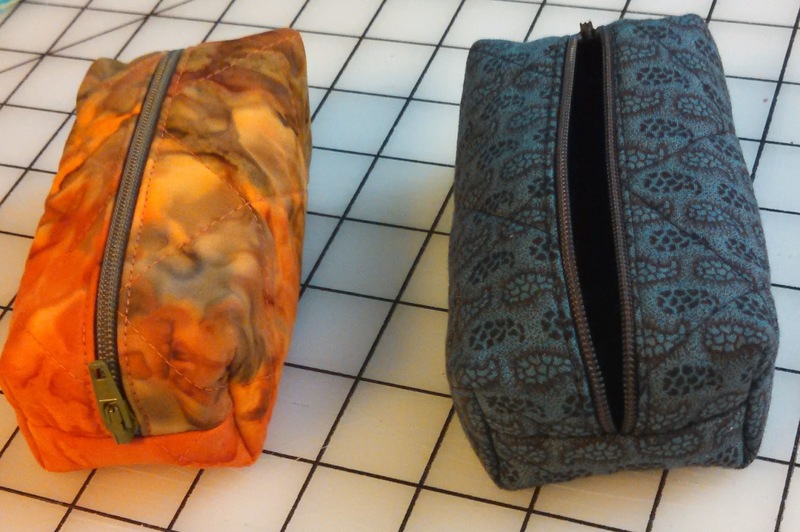 I made 2 Sweet Zips. You can find a link here and another here with downloadable instructions. 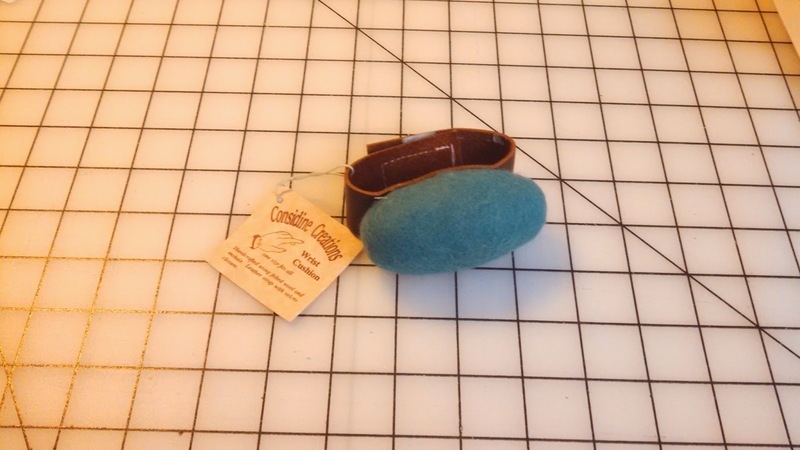 It is an easy sewing project, and the pattern is meticulous about making sure the insides are all finished. They are super cute and super small! I think this will be a good way to get over fear of zipper insertions for the kids, too. I still have 2 more of each kind to make. 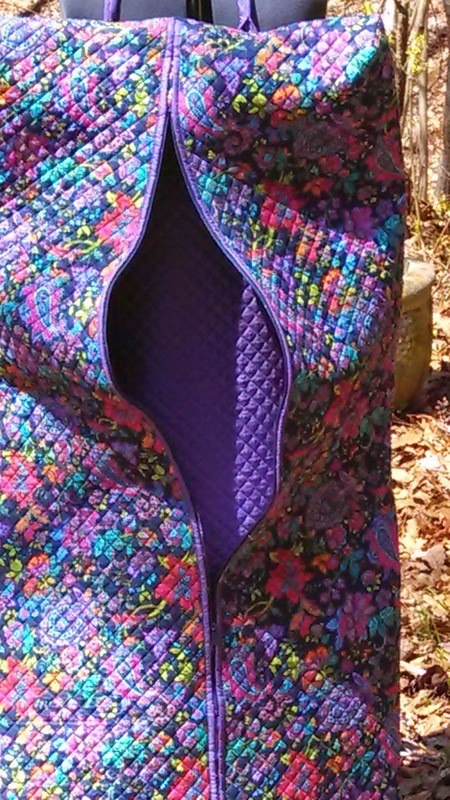 The fabric is already quilted and ready to go, but I needed to buy more zippers. Lately, I've been sewing more. A lot more. Combining an easy sew followed by something more time consuming makes me feel like a lot has been accomplished. Anyway, this is a more involved sew for youngest dd. 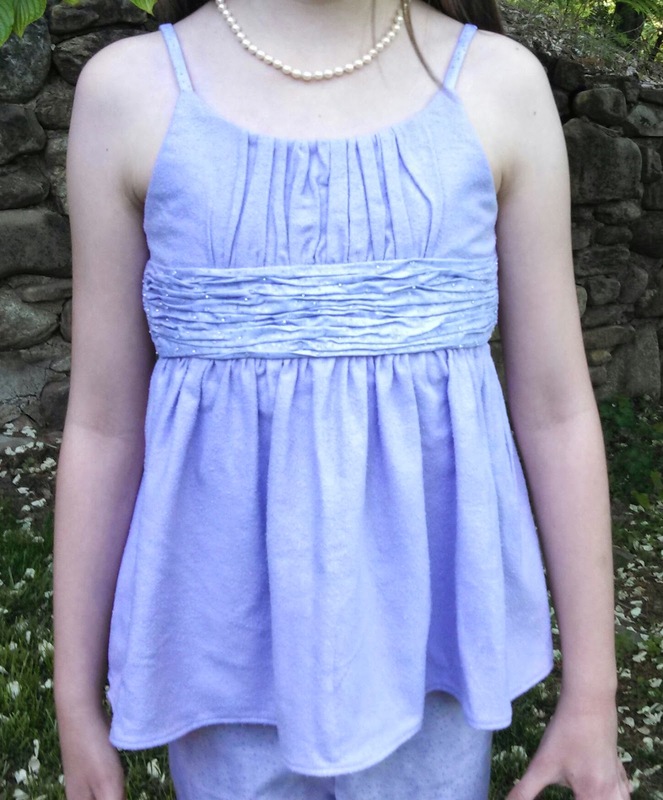 This fabric was selected by and purchased for her older sister to get an outfit which never happened. 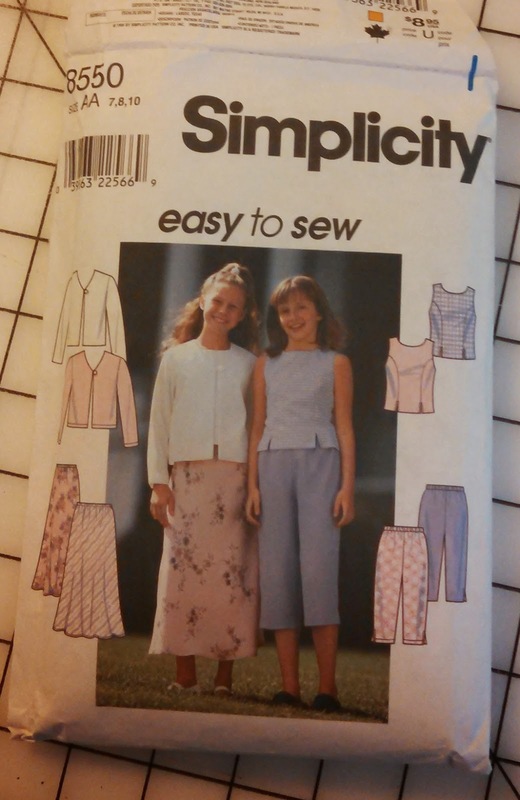 I had bought some lavender raw silk and a printed quilting cotton intending to make Simplicity 8550 princess seam top and cropped pants. The raw silk was a bargain price because there was a fade mark down the middle of the 1 yard piece. I think I had planned to use the cotton for the pants and the silk for the top. 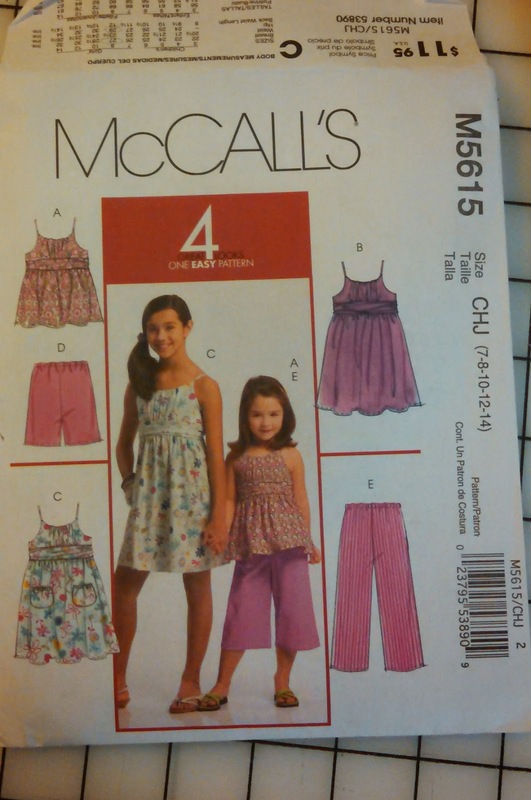 Youngest dd liked a different top pattern--McCall 5615 View A--so we went with that instead. 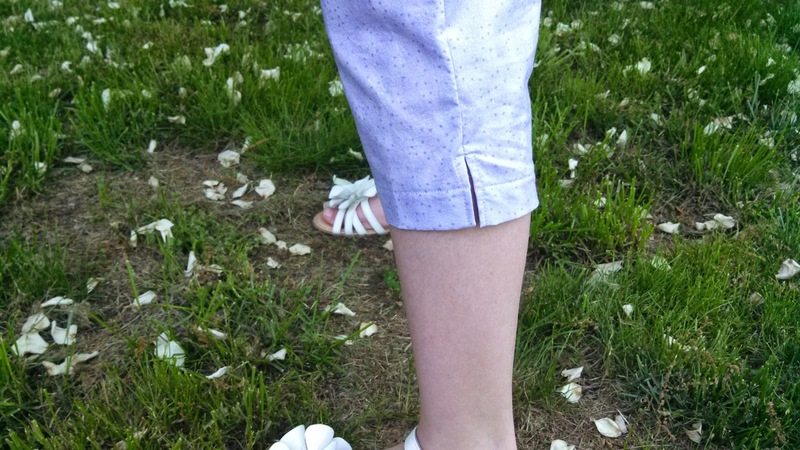 Still did the Simplicity pants though because they were much narrower. The ones from McCall were quite roomy looking. I liked the detail here. I really disliked the floppiness of the gathered mid-section of the top. 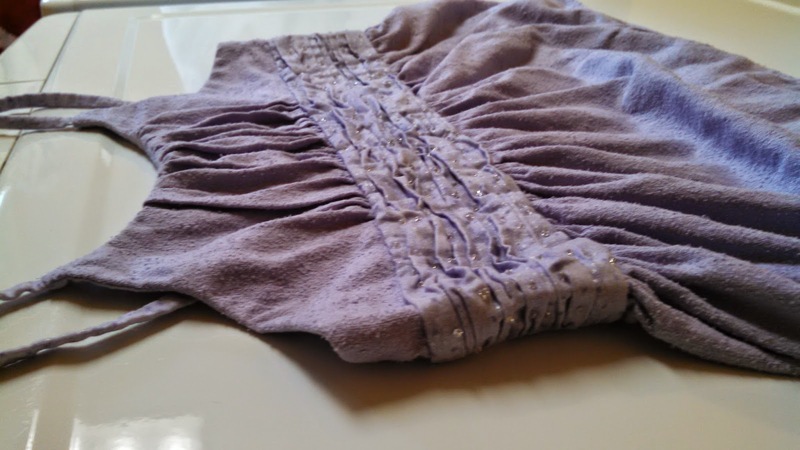 There was nothing to secure it so it would always look nicely gathered after washing and during wearing. In a fit of inspiration, I decided to sew beads randomly on it to hold those gathers in place. Can you see the glittering seed beads? This is more like the real color. The beads add some interest and detail. 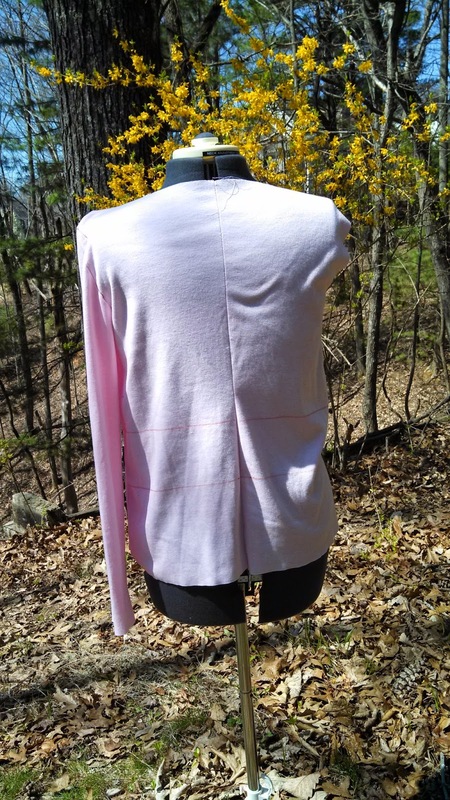 While I'm not sure it was worth all the extra work after catching dd stuffing it through the regular wash and dry cycle, it will make a nice spring and summer outfit--if it survives! I have some other fabrics to make another outfit just like this one, and already have it started. The straps on both have given me fits! This is my last catch up post from last year. Happily, some of the items I made this year, so I guess that makes me current! Yes! 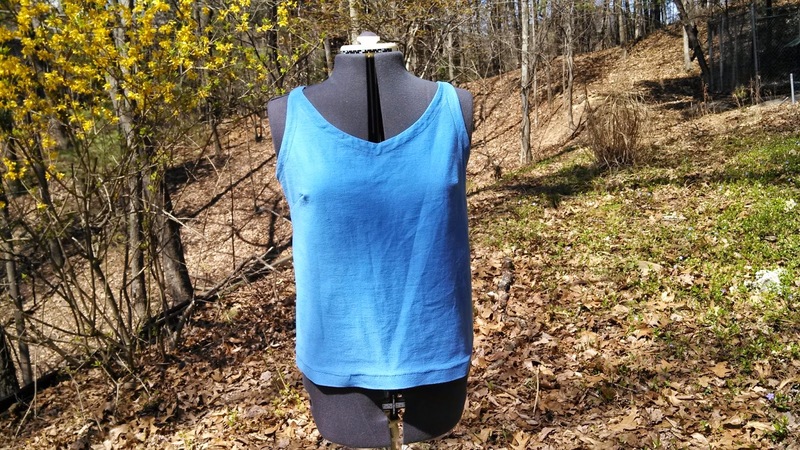 In the fall of 2013, Sarah Veblen was here teaching a knits and t-shirt class. We spent a large portion of time discussing knits, sewing techniques, playing with samples--really a great exploration of knits. The rest of the class we worked on muslins. 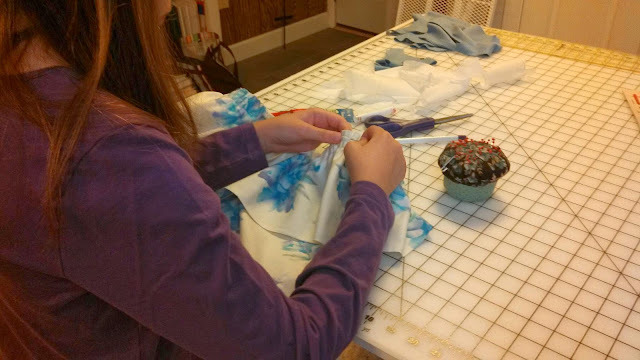 Sarah helped each of us fit our muslins that we'd brought to class, and then transfer those changes to our patterns. Rather a lot of work, but well worth it. After making a couple of them, I realized that I wear a lot of knits so I should make more. Lots more so that I can become more proficient (speed!). Knits have the potential to be rather challenging because each one is so very different--experience helps a lot with that. Really there is no need to delve into the nitty gritty--this has orange Sharpie marker all over it, and one sleeve! Something out of an horror movie, yes? 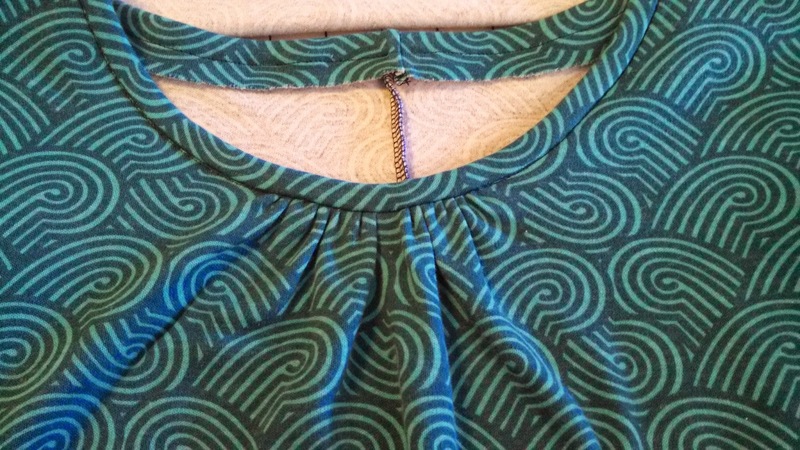 The biggest changes to my initial pattern were the bust dart, adding a center back seam, and adjusting the sleeve. My initial attempt was constructed using Pamela's Patterns The Perfect T-Shirt. I really do like her patterns! Here is a wearable t-shirt. It's my first attempt at one after class. I scooped out the neckline and modified it to be a sweetheart neckline. 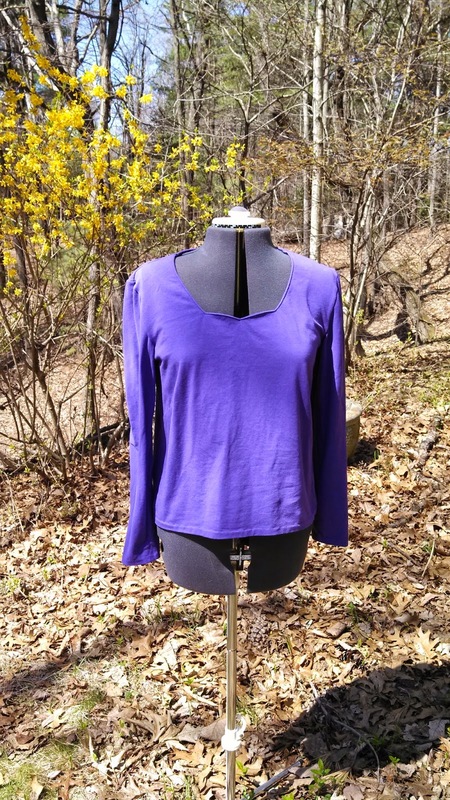 Threads magazine had a recent article on adjusting a neckline--most fortuitous! I used the same cheap knit fabric from Joann's. Unfortunately, this fabric is not holding up well at all. I use a hand wash cycle on my front loading washer, and hang to dry. The fabric has pilled rather substantially. I had some trouble with the heart portion of the neckline sticking out a bit, but it isn't nearly as bad when worn. 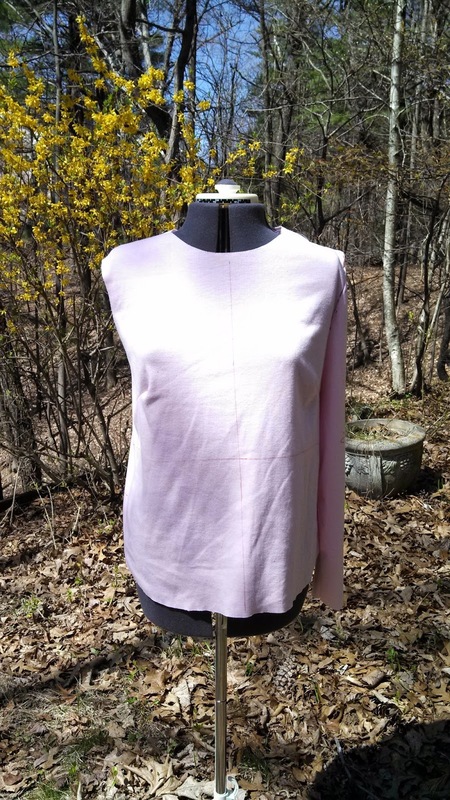 This pic isn't great, but I figured if I had a sweetheart neckline, then the sleeve really ought to have one as well since I made them 3/4 length. Used a rather deep facing on this which has worked fine. I liked my first one, so I rapidly made a second one. 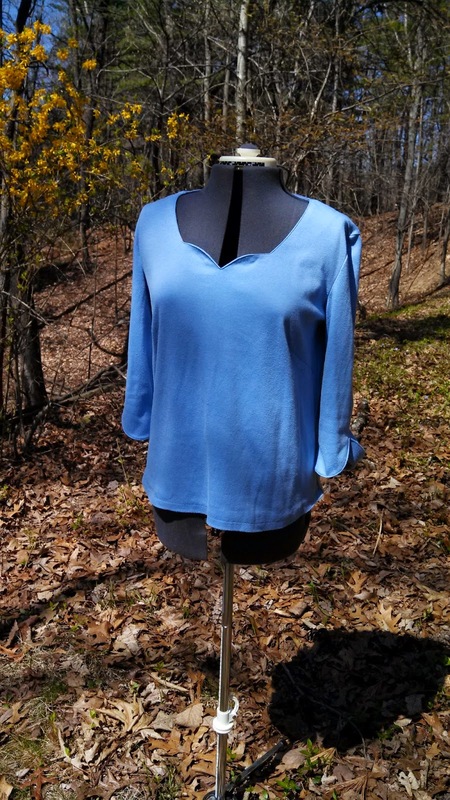 I changed the sweetheart neckline so it wasn't quite as curved, and made long sleeves with a plain hem. This fabric is a cotton/lycra from a store about an hour from me. I love this fabric!!! It's held up quite well to regular wear, and is quite soft. And, I have yet another one in the works! I've gotten interrupted by finishing that dreadful travel set, and by heading up our sewing guild's new youth neighborhood group. Not bad things! 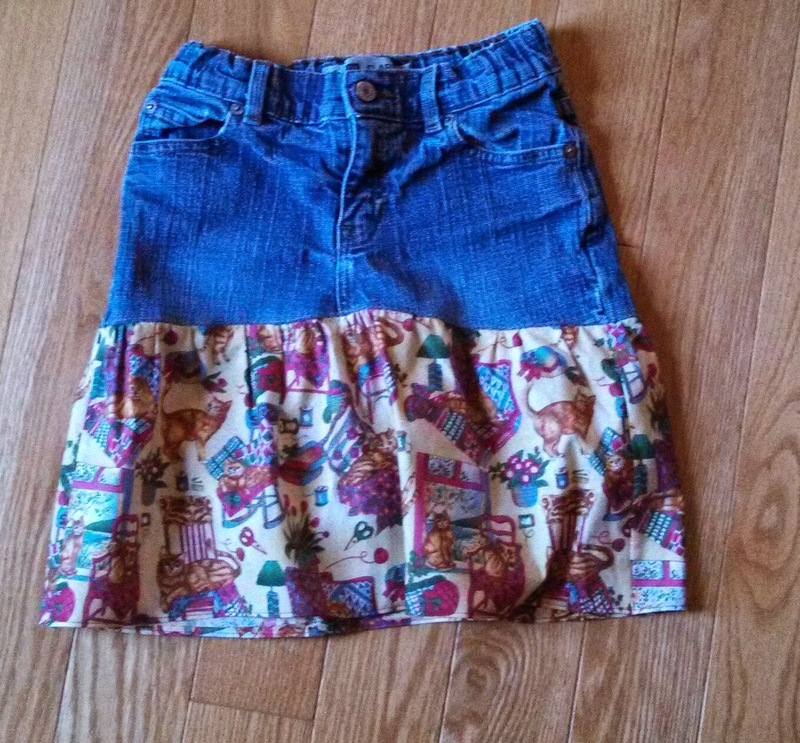 Jeans cut off and attached to gathered fabric to make a skirt. I have really enjoyed playing around with the necklines on the knit tops. It's a lot of fun to do, and makes each one look a bit different from the last one. After being inspired by Mary Ray's presentation and workshop, it was obviously time for me to begin a project. While it wasn't a skirt per Mary's class, it was nice to work on a stash item. 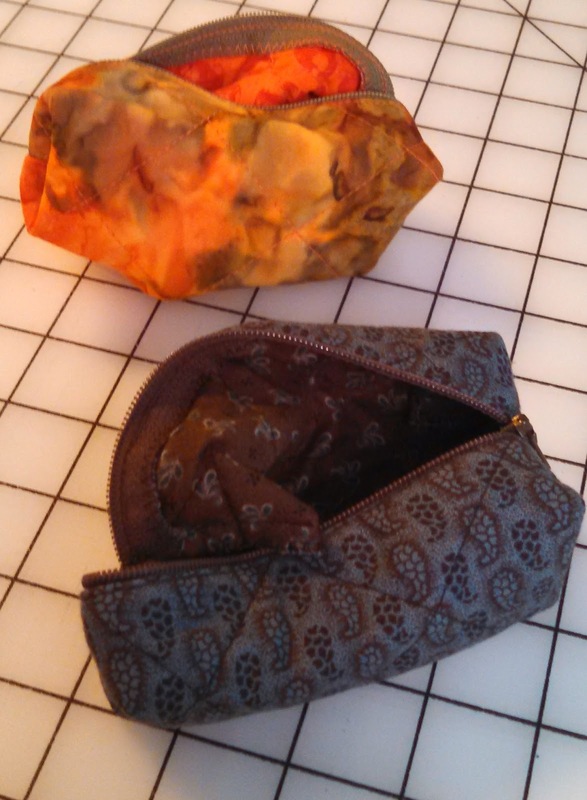 So I started on a pattern and pre-quilted fabric that I'd bought at the 2010 ASG conference. Let me just say that this pattern was not great--I found the instructions rather confusing. I started on it last year, got as far as zipper installation on the garment bag and stopped. Since I don't have grand things to say about the pattern, I think I will skip posting information about it. I modified the handles significantly. I cut them in half and installed at each end instead of having them placed in the middle. Hopefully, this will allow less garment wrinkling. 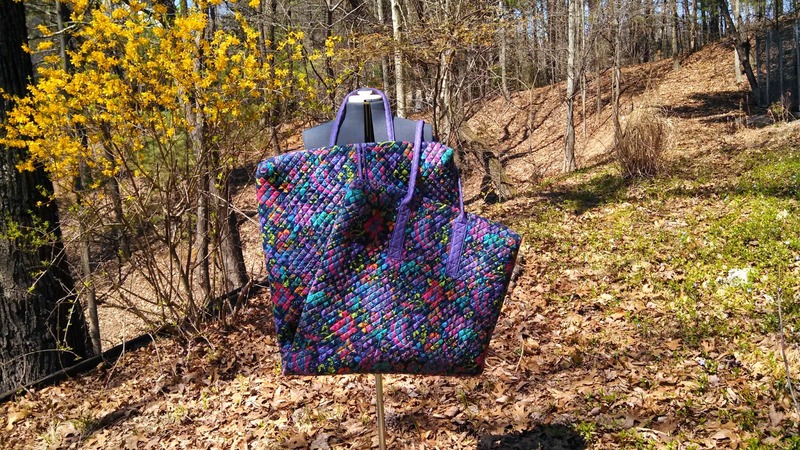 Tote bag, lingerie bag--both need buttons! 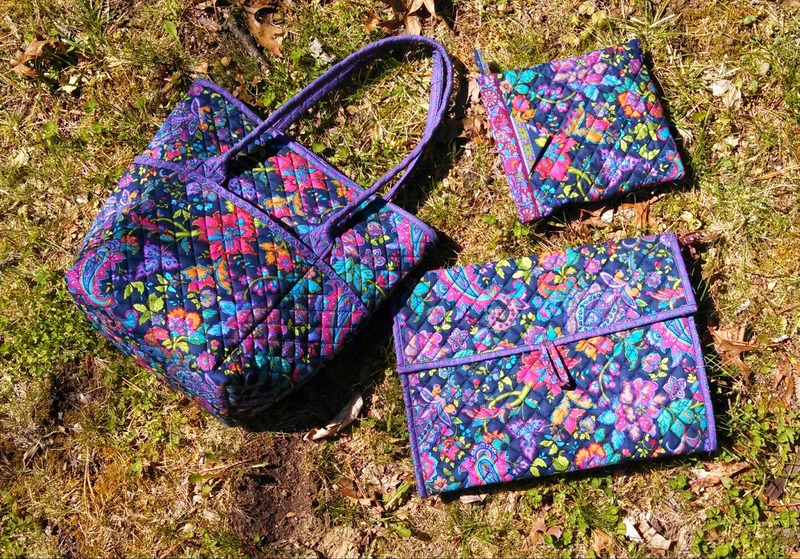 Top right is a snappy bag which wasn't part of the pattern set, but something I learned to make through my local sewing guild. I can drive people up the wall rather quickly snapping my bag--fun! All in all, the set turned out nicely and I think I will enjoy using it--if I ever get to travel! 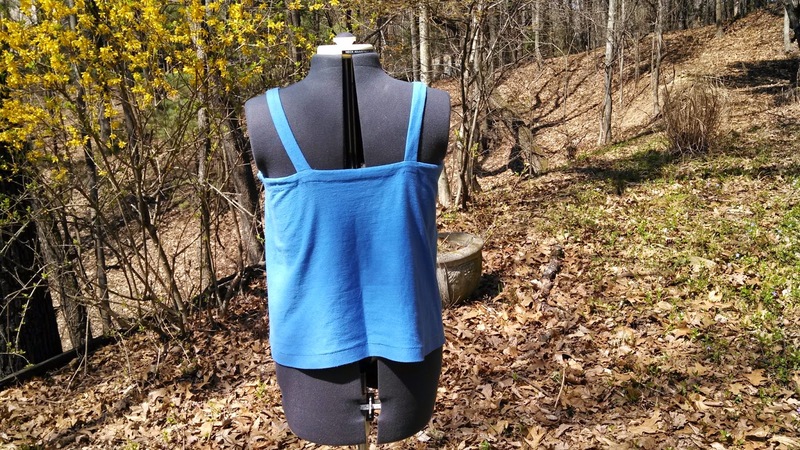 At the 2013 American Sewing Guild conference, I took Pamela Leggett's Perfect Tank Top class. Great class--nearly finished the tank. Great pattern, too. Unfortunately, I shortened my straps a bit too much so the darts aren't positioned properly but that's easily fixed in subsequent versions. 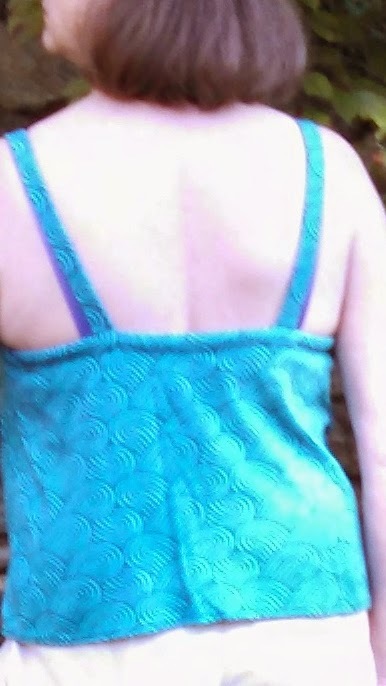 Another thing that I did that I should not have done was used one of those Frixion pens for drawing on where the topstitching needed to be--I think it would look very poor if it wasn't exact since it must arc and curve upwards at the front straps. The idea of marking the stitching line was appropriate, but my choice of tools was not. I did not test it first since I'd used it before without a problem. What I found here was that on a darker fabric, it left a shadow almost like a white line after I ironed it. Due to both mistakes, I think I will just consider this a muslin! Too much work to redo the straps AND figure out how to cover up those markings. I really like the front v-neck. Sorry for the poor picture! I have a current version of this tank that is almost ready to go. 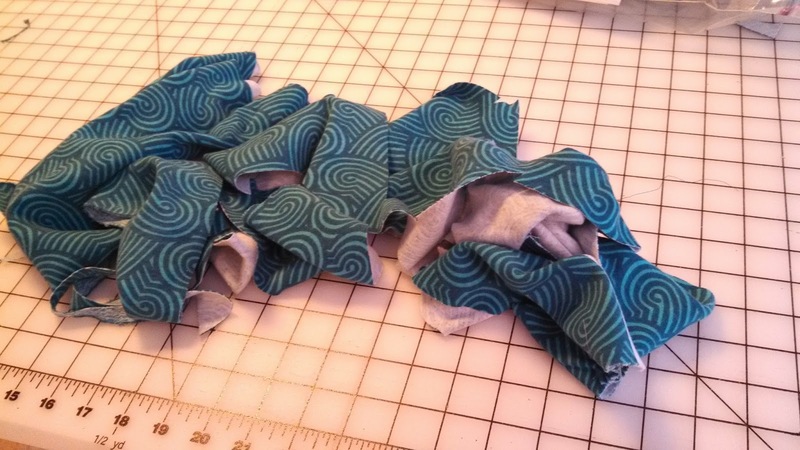 It's one of those optimal sewing moments when you use virtually every last scrap of your fabric! Isn't that always a terrific feeling? 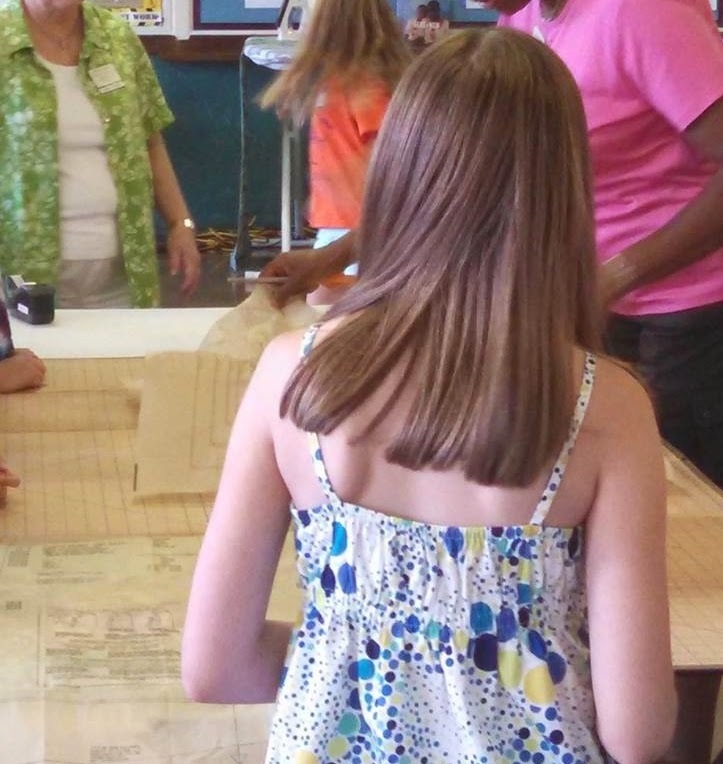 In June last year, our guild hosted Mary Ray as our evening program speaker, and as a teacher for a day long skirt class. DD the youngest and I attended both events--super wonderful! 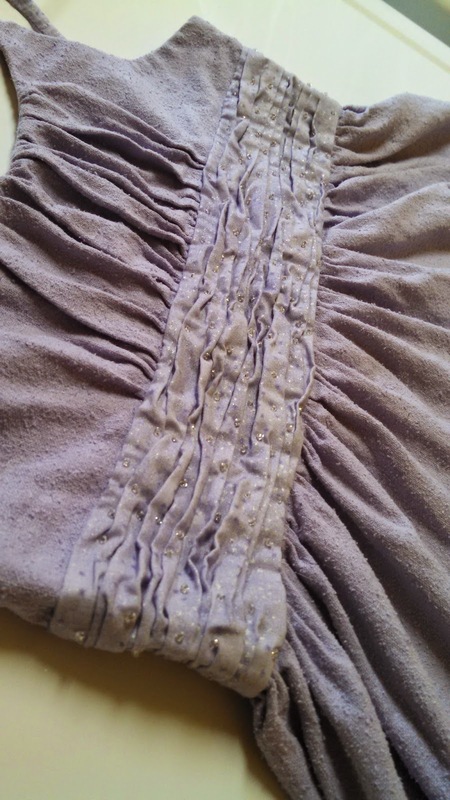 While I haven't achieved a skirt using Mary's technique, dd has! I helped her a bit, since she'd never done French seams, hand basting (which she declared she loved! ), waistbands or elastic. Ah, the joys of working on a much neglected blog!